Jordan Bishop (M.S. 2016) completed his thesis “Examining Valve Shape Variation in the Freshwater Diatom Genus Eunotia over Time and Space” and now is working on a Ph.D. at Charles Univ. in Prague, CR. Nik Schultz (M.S. 2016) completed his thesis and is working for a biotech company in NH. Congrats! Marie Canieso (B.S. 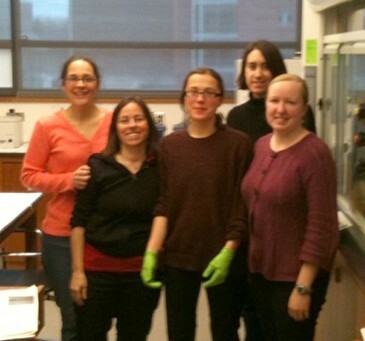 2016) did research in our lab on cell walls of green aglae and helped to keep our lab in tip top shape. She is heading to Medical School! Congratulations! Karolina Fučíková (Ph.D. and Postdoctoral Associate). Now Assistant Professorship at Assumption College in Worchester MA. Stephanie Brew (B.S. 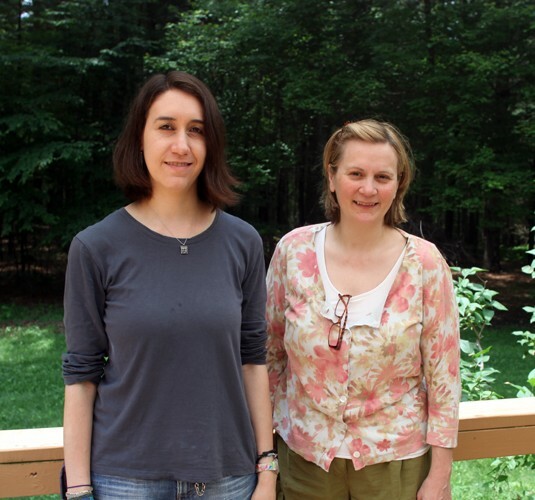 2015) worked in our lab for 2 years and graduated in 2015. Congratulations! Diba Khan-Bureau received her Ph.D. in 2015. Congratulations! She continues her position at Three Rivers Community College. Dr. Shin Watanabe (University of Toyama) was here the summer of 2014. Crystal Xue worked in our lab to characterize the green algae that symbiose with spotted salamanders in the egg stage. She earned her B.S. in Spring 2014. She is headed to Med School. Congrats! 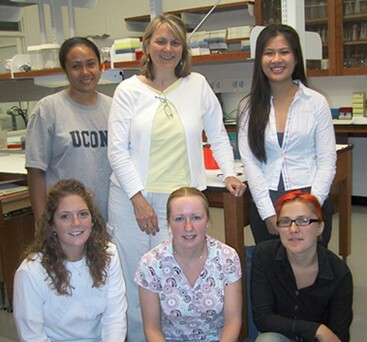 Shelley Olm (Research Associate) was an important part of our lab for over 10 years and departed in July 2013. Molly Letsch (Ph.D. 2011). 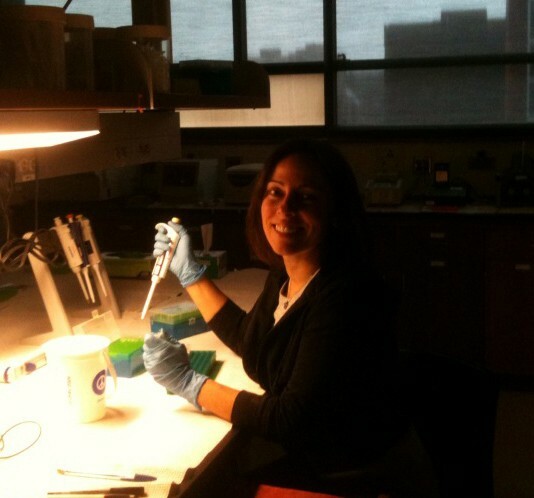 Molly is an adjunct faculty member in Biological Sciences at Le Moyne College. Congrats! Nic Tippery (University of Wisconsin) was a Postdoctoral Researcher on the GrAToL (Green Algae Tree of Life) project in 2010-2011. Now he is an Assistant Professor in the Department of Biological Sciences at University of Wisconsin, Whitewater. Chien Lo just graduated with her Pharm.D. degree at Uconn. 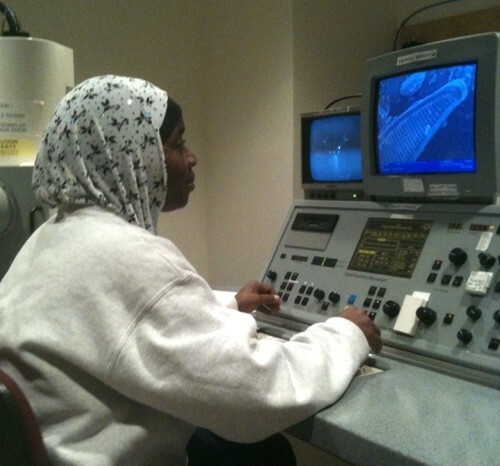 She did extensive work on South African soil algae in our lab. Dr. T.A. Adesalu “Bose” (University of Lagos, Department of Botany and Microbiology) visited during September-November 2010. Jared Rada (Undergraduate Student in Biology), is in dental school. Nicole Pietrasiak visited in 2007, 2008, 2010. She is an Assistant Professor at New Mexico State University! 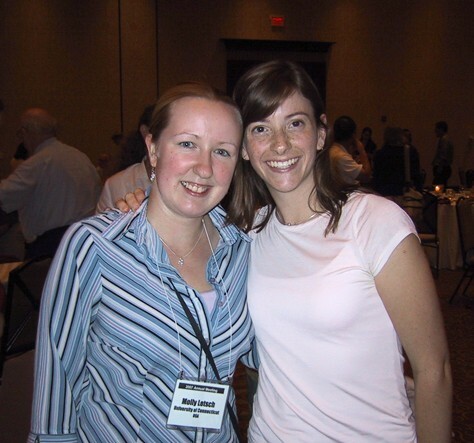 Hilary McManus (mcmanuha@lemoyne.edu) (Ph.D. student 2001-2007) is an Associate Professor, Dept. of Biology, at LeMoyne College in Syracuse NY. Dennis Gray (Postdoctoral Associate 2005-2006). David Hoover (BS 2003, MS in the Integrative Geosciences Program at Uconn) received his Ph.D. from Colorado State University, Fort Collins, working at the SGS-LTER. Dr. Andreas Holzinger (Univ. 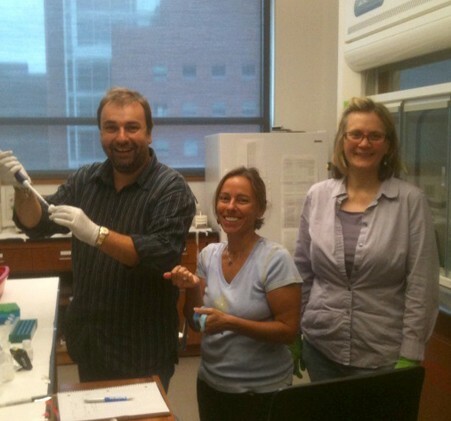 Innsbruck) extracting DNA while Shelley Olm and Louise Lewis supervise, Aug. 2010. 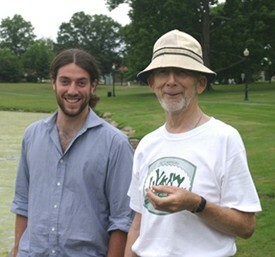 Dave Hoover (left) and Dr. Frank Trainor (right), with Hydrodictyon bloom in Mirror Lake, Uconn campus. 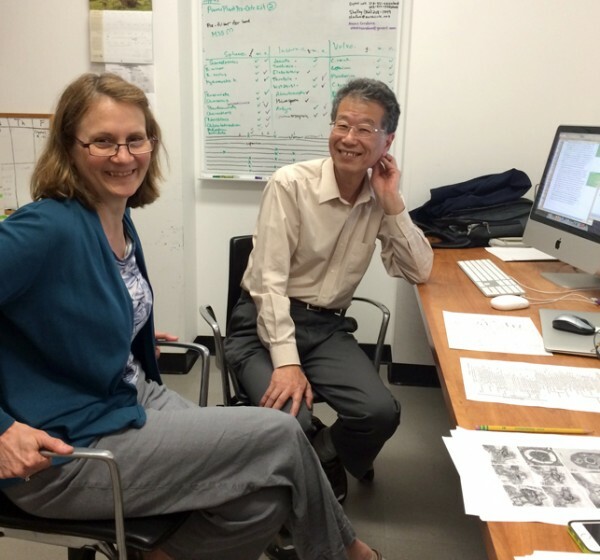 Louise Lewis and Dr. Shin Watanabe (University of Toyama) discuss green algae ultrastructure in 2014. 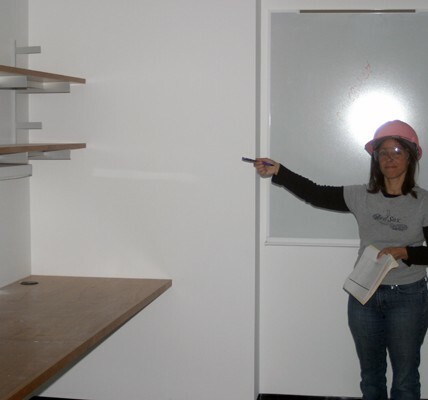 Shelley in 2004, just before our move to the new lab. 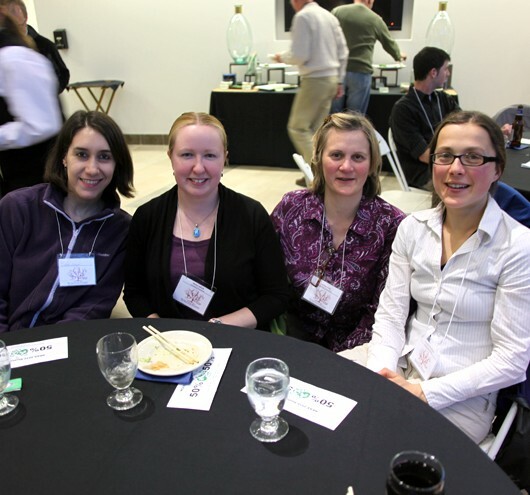 (L to R) Elizabeth Salinas, Molly Letsch, Louise Lewis, Karolina Fucikova at NEAS 2010.